In today’s fast-paced world of entrepreneurship and corporate ladder-climbing, individuals are quick to call themselves “professionals”. While it’s true that anyone can turn a dream into a profession, there is a real difference between struggling to get by and success. Simply put, in the category of high level of expertise, what Prince and Rogers call “talented experts” excel in successful networking, resulting in substantial client relationships and repeat customers. In the area of high level of expertise, knowledgeable professionals with strong business skills and effort are worthy of obtaining the ‘right clients’ with the ‘right amount’ of power, but lack self-promotional skills and often are in the shadows of their competitors. Thus they are disadvantaged in the areas of networking and marketing, and their companies fly just inches under the radar, missing out on lucrative business opportunities. Labeling oneself as a professional doesn’t grant access to established clients and a reliable income. Individuals considered incompetent within their field or industry typically lack expertise in specific venues and are limited in terms of success. Being in this realm isn’t permanent, but individuals who find themselves in this conundrum have a difficult time understanding THEY are the problem, therefore disabling them from developing the skills and commitment needed in order to see opportunities arise. 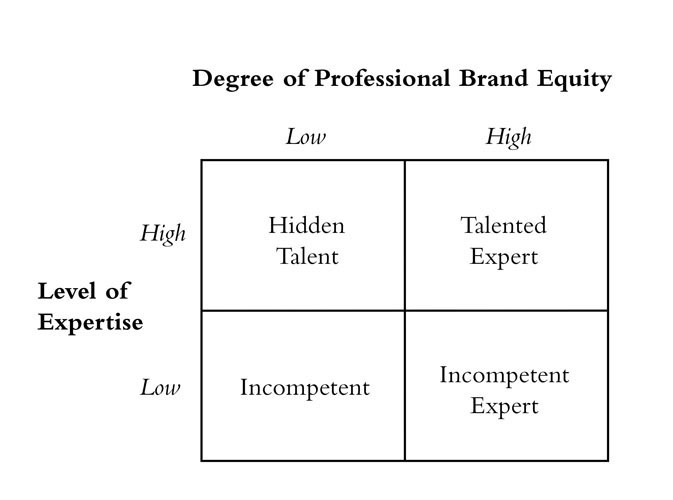 The last quadrant is reserved for professionals who are incompetent experts. These folks, as Prince and Rogers suggest, may not be experts in their career, but have established a solid and alluring brand with the right groups of people. Their clients are loyal and repetitive, but the knowledge and success of the individual is only an illusion. This type of professional is often the worst to encounter, as an inflated ego leads to unrealistic ideas of success and inaccurate measurements for reaching one’s goals. As a writer and editor who deals with business-to-business encounters, I find this category to be the most common, and the most problematic when it comes to establishing consistent, solid client relationships. These clients fail to understand the two-way street that makes up a connection, and are only willing to work under conditions they set. While this mindset may temporarily deliver results, stubbornness and an inability to adapt to outside opinions and ideas cuts contact with potential partners and limits the amount of expertise one can claim to have. In order to reach the level of success that comes with establishing a high-caliber clientele, one must be willing to continue education in a specific field or industry. Dedication, a willingness to learn and an eye for discovering opportunities opens the door to be recognized by the companies and leaders that promote growth and business development. If you have an idea or a passion to succeed, but are falling short of meeting your goals, reassess your position in your industry and look for ways in which you can grow so that your business and your services are recognized for their full worth and potential.